Jamaica is jam-packed with fun activities and adventures for all the family to enjoy whilst on island. We have selected our favourite activities which we, here at Meon Valley Travel think every teen would love! For all the James Bond fans out there, why not go for lunch at Ian Fleming’s GoldenEye Hotel. Fleming, the author of James Bond came to the island in WWII and bought the property. It was here that Fleming dreamed up James Bond, an infamous character, renowned worldwide. As well as the Hotel’s connection to Bond, it is host to fantastic restaurants, with specialities including: delicious jerk chicken and Jamaican style Ackee. For the daredevils out there, cliff jumping by Rick’s Cafe is the perfect way to get an adrenaline kick! It is also a fun spectator’s sport, if you prefer to relax at the café and watch. The food at Rick’s café is truly delicious, our favourite is the ‘Dog Bowl Reggae Sundae’ which is perfect if you have a sweet tooth. It is a combination of Oreos, chocolate chip cookies, nuts, cream, and caramel, among many other ingredients. This is a great activity all of the family can enjoy. 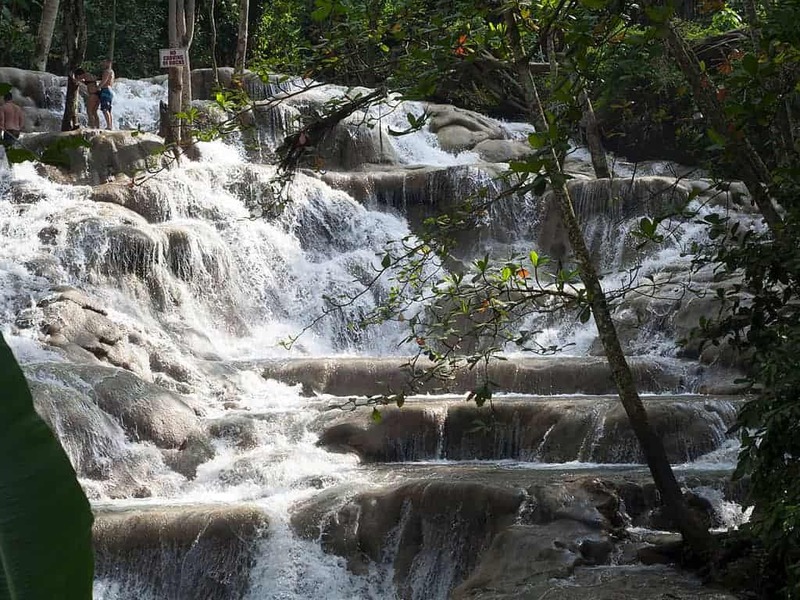 A climb up a waterfall at Dunns River Falls takes about an hour; but the experience is worth it. Dunns River Falls was also featured in the James Bond film ‘Dr. No’. The lagoon is home to millions of dinoflagellates, so at night the lagoon shimmers and sparkles with the glow of these organisms. It is a once in a lifetime experience to see this phenomenon for yourself. Take a tour around the lagoon, and at the end you can jump into the lagoon, to surround yourself by a magical, surreal, luminous green glow. At Rocklands Bird Sanctuary you will have the opportunity to feed a hummingbird out of your hand! This rustic and relaxing bird sanctuary is the perfect way to spend an afternoon, the sanctuary is home to thousands of birds; meaning you could be lost for hours exploring. Reggae Sumfest spreads across Montego Bay in Jamaica, it has been coined ‘The greatest reggae show on Earth’. Each night of the event is themed differently with a colourful array of parties in different locations, all close to Montego Bay. The event is prolific for having only the best reggae stars, and is the largest concert festival in the whole of Jamaica. The event takes place from July 17 – 23 2016. Ninemile, which is not only the birthplace, but also the final resting place of Bob Marley. The surrounding village is where Marley drew inspiration for many of his songs. See Marley’s infamous ‘Rock Pillow’ which is where he used to meditate, and stop nearby to visit the mausoleum, which is where Bob Marley is buried. Tubing on the White River is an exhilarating yet relaxing way to spend an afternoon. Lay in a tube ring and relax while you float along this tropical paradise. Surrounded by beautiful mountains and sounds of nature, your guide will take you on a journey through crystal clear water, a perfect day out for all the family. Discover the legend of the White Witch, guided only by candle light around the apparently haunted house, whilst listening to captivating and chilling stories. At the end of the guided tour you can visit the dungeon, which has been converted into a tavern; Annee’s pub. Where you can indulge in a glass of ‘witches brew’. The caves are filled naturally with pristine water, and surrounded by lush vegetation. These caves are bursting with history, during the 17th century when the English invaded, the Spaniards used the caves to hide in. Throughout the tour you are guided in and out of the caves, so you can really experience this wonderful natural phenomenon. This subterranean lake is showered with light holes from above, it is a beautiful sight, and one that we would recommend for all the family.